Pupsters! It’s official! 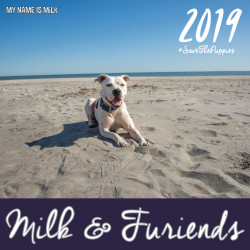 The 2018 Milk & Furiends calendar is available fur pre sale and will be shipping out and appearing in retail locations throughout the Lowcountry within the next two weeks! Wooferoo! Jeanne Taylor Photography hosted a foto competition earlier this year fur us and we hads dozens of pawsome pups come out in their dapper and beautibull bestest. After several rounds of deliberation by the jury, the winners have been chosen and are spotlighted on each month, with ALL of the pawticipants sprinkled throughout the monthly dates! 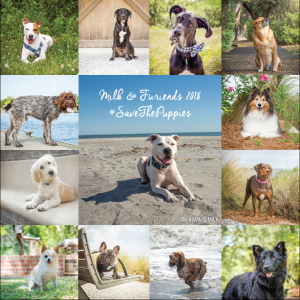 Of course, yours truly is on the cover, but this is pawsitively a PupsterPosse collaboration to help #SaveThePuppies. PS – They make pawfect pawsents too!  PrintingCenterUSA gave us a generous sponsorship to help offset our printing costs! 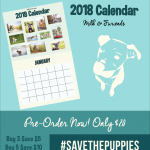 Wag on over to see how you can get your own pawsonal calendar or set up a fundraiser too! ***New pet friendly shelter and boarding locations will be added as we receive information!! Pawlease email of facebook message to help us add to our list***Livestock & equine boarding added! Oh Pupsters! The third year of weather bringing us horrible stormies to FL, GA, SC, & NC! AGAIN!! 2015 brought the 1000 year flood, and then Hurricane Matthew in 2016 hit my hometown in Charleston, SC! 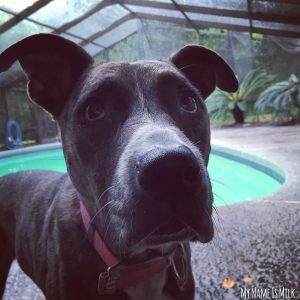 Hurricane Irma is approaching Florida quickly and I wants to provide resources for hurricane evacuees with pets in FL, GA, NC, and my especially my home state of SC pet friendly evacuation shelters, pet friendly housing accommodations, discounted housing and animal boarding, and other pet friendly hotels and options that may be available for you and/or your fur babies! Many of our animal shelters along the lower east coast will be evacuated for Hurricane Irma and many pups, cats, and horses are in need of places to stay! 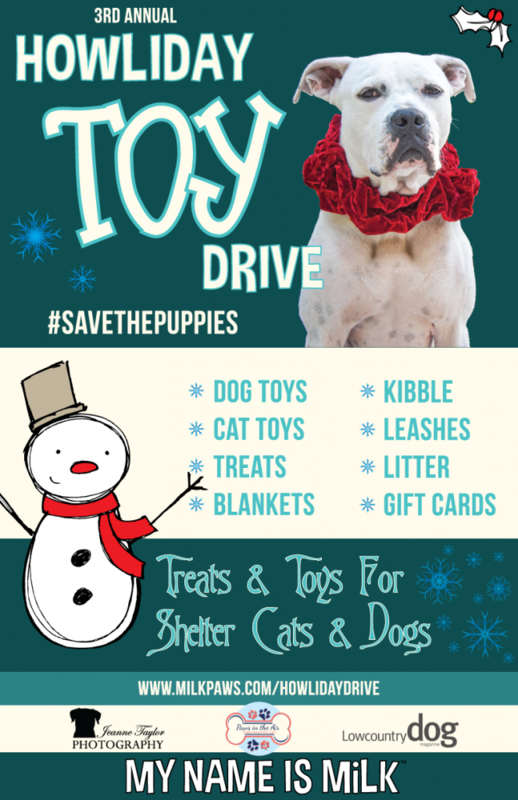 Here are some of the places I have found helping pups and their hoomans in need! CALL 1-800-342-3557 (Florida Emergency Hotline) They will help those that need help leaving/have no way out (ANYONE! includes lack of transportation, money, etc!) and will help with pets and transport. Especially important to call if you are turned away from a shelter to get real time help. After noon today they may not be able help rescue/transport people in certain areas for the safety of the emergency personnel and high winds. Please encourage people to call the number now if they even think they might need help. ** The Florida Department of Agriculture and Consumer Services, Division of Animal Industry, has temporarily suspended the intrastate movement requirements for the transportation of animals from the areas expected to be impacted by Hurricane Irma. Border states have waived their interstate import requirements for Florida’s pets and livestock leaving the expected impact areas of Hurricane Irma. 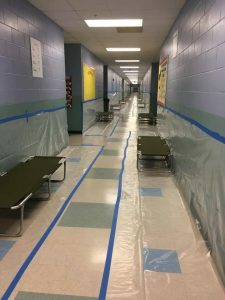 Pet friendly evacuation shelter can hold 300 people and up to 700 animals, including dogs, cats and birds. You must be pre-registered, have proof of residency in Palm Beach County, and live in a mandatory evacuation zone. For more information and to pre-register, call 561-233-1266. Broward County Pet hurricane hotline 954.266.6871. Doctor Michael Krop Senior High, 1410 NE 215th St. 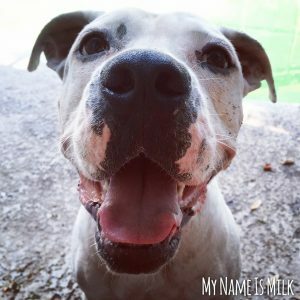 If you live in Miami-Dade and want to take your animals to a pet friendly shelter you are encouraged to pre -register online at www.miamidade.gov/hurricane or call 786-331-5354. Monroe County has a pet-friendly shelter at E. Darwin Fuchs Pavilion (10901 SW 24th Street), but due to the city declaring mandatory evacuations, the shelter will not be available. 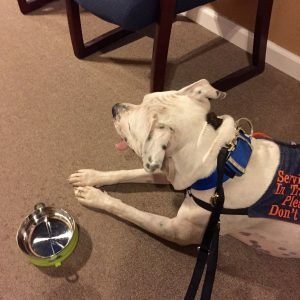 There are no pet friendly human/pet shelter in Martin County. The Humane society will be taking pets on first come. Martin County has an agreement with the Treasure Coast Humane Society at 4100 SW Leighton Farm Ave. in Palm City, FL to house PETS ONLY of families living in mandatory evacuation zones. For more information and to pre-register, call 772-223-8822. Identification for your pet – include a current photo preferably one with you and your pet together. A crate and bedding large enough for your animal to move around in when contained in the crate, as well as hold water food and litter. A sheet to cover the crate to help relieve stress. Note: Pets are welcome at all shelters. Evacuees are reminded to bring crates or at least have pets on leashes. Germain Arena advises they do not have pet-sheltering capabilities. However, no one will be turned away from the shelter while capacity remains. 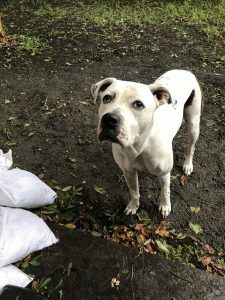 ***IMPORTANT*** Please bring food and water to the shelter with you! For information, go to http://bit.ly/1dYb4cj. 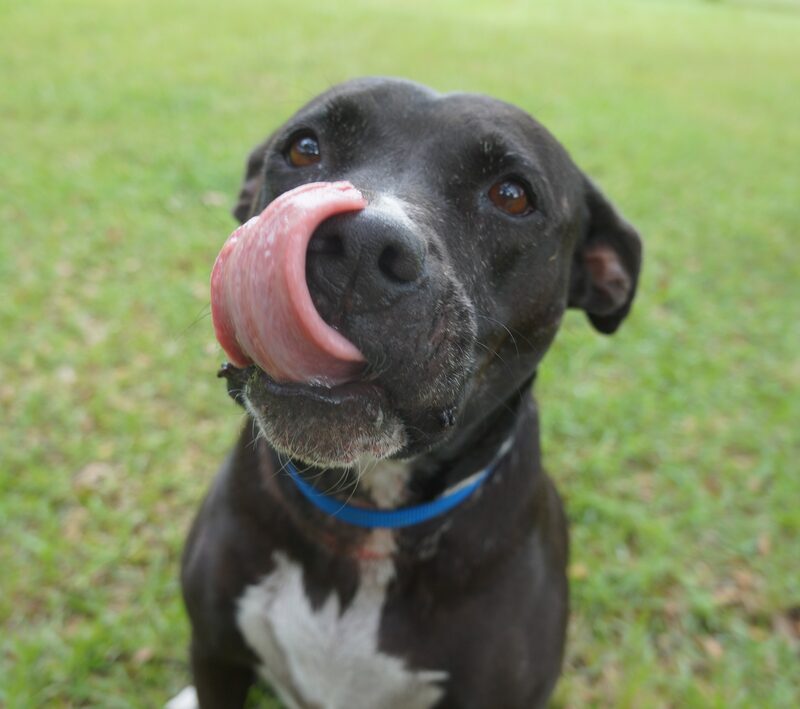 Lee County emergency pet shelter information line is 239-344-4424 or go to http://bit.ly/1KYguil. North Collier Regional Park, 15000 Livingston Road, Naples, FL. **Pre-registration is required** Registrations are suspended once a Hurricane Warning has been issued. A pet-friendly shelter is offered by Collier County Domestic Animal Services in conjunction with the Collier County Bureau of Emergency Services and is limited to 75 animals. FREE MICROCHIPS Wednesday and Thursday from 10 a.m. to 1 p.m. for the first 200 cats and dogs that are current on their Collier County licenses and vaccinations. The Humane Society of Vero Beach & Indian River County has accepted the responsibility of helping manage this pet friendly shelter. Contact Ilka Daniel at www.hsvb.org or 772-571-6408. 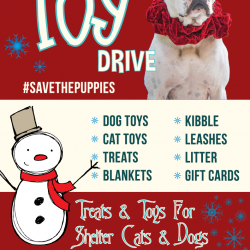 Residents need to bring crates for their pets, as well as food, water and litter. Pet-friendly shelter. All pets must be crated. All pets must have proof of vaccination and Nassau County license, be properly crated or caged and be maintained by their owners. Animals may be housed in a separate room from their owners. Orange Park is the only shelter that will allow pets. Levy County public information lines – 352-486-5155 or 352-486-5576. Must bring own crate, food, and water. Atlanta Motor Speedway will open its camping facilities starting Thursday, free of charge, to evacuees seeking temporary refuge from the approaching Hurricane Irma. Evacuees will have free access to hot showers and restroom facilities. Pets will be taken care of by the Animal Welfare Department’s staff. evacuees are encouraged to call in advance at 706.884.6818. Shelter for Hurricane Irma evacuees AND THEIR PETS as long as they come with kennels. Anderson Civic Center – 3027 Martin Luther King Jr. Blvd. Alabama State Parks is waiving fees for evacuees. 19477 Fairground Rd, Robertsdale, AL. 36547. Pole barn and can set up panels. Fenced area for dogs, goats. Area for chickens, goats. Evacuees will receive significantly reduced rates. Please call for more details and to get your shot records on file. If you or your friends are being evacuated or staying here in Georgia because of Hurricane Irma, but you don’t know where to leave your furry family members, we have rooms available (and will make more room if needed) for dogs, cats, birds, reptiles, etc. Will need records of vaccines (rabies, bordatella, distemper/parvo) Limited space available. Discounted rates. Effective Thursday, September 7, 2017 at 8:00 a.m., the Georgia National Fairgrounds & Agricenter will serve as an Equine evacuation site for those in the line of Hurricane Irma. GNFA has a limited number of stalls available that will be opened to evacuees on a first come, first serve basis, no reservations will be accepted. Owners will be required to provide the necessary feed, hay and tack to care for all horses while here. With the limited number of stalls available, equine owners will need to have a secondary site in case they’ve met capacity before arriving in Perry. Additional site locations can be found here. 55 empty stalls, hot and cold water wash bays, and a fully enclosed arena! 13 RV and LQ hook ups, near resort and hotels. Pupsters it makes me sad that we have a day like National Dog Fighting Awareness Day, but we must have it to raise awareness about the prevalence of dog fighting in our communities! The ASPCA has created this day to raise awareness so everypawdy can #GetTough about dog fighting and say no more! It is a problem that is worldwide, in big cities and small towns. It happens in areas of poverty, and areas of wealth. That hoomans can gain pleasure from fighting poor innocent dogs makes my heart hurt. And it is because of dog fighting and the common “use” of pitbulls and bully breeds in dog fighting that adds to the horrible stigma against pitbulls and bully breeds. But the pain doesn’t stop with pitbulls and dog fighting. Often dog fighting trainers use kittens, cats, puppies, and small breed dogs as bait dogs to train their larger fighting dogs. They even use ‘weaker’ large dogs or pitbulls. These so-called humans often look for free animals on craigslist or facebook, and steal loose pets and animals in their communities. These evil people need to be stopped. Our animals need justice! Our legislature needs to be stricter against these hideous offenses! Can you believe people think I am a bad pup just because of my breed cause they think I’ll fight? Did you know that many dogs rescued from fighting situations are great with other animals – some right away and some with just a little training! National Dog Fighting Awareness Day is so close to home because my brofur Buddy was a Craigslist dog we rescued from a dog fighting situation. He still bears the scars and botched cropped ears but I can assure you he is spoiled rotten living with us! 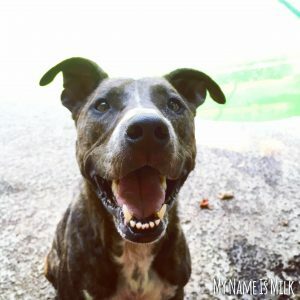 Because of Buddy and many others, we have created the BuddyBusters program to help educate the community about dog fighting and animal cruelty, and to provide dog rescue, rehabilitation, and medical care to these pups in dog fighting. Don’t post pets for free on social or for sale sites. Always ask for a rehoming fee & vet references, or ask a local rescue or no-kill animal shelter for help. Last Friday was a harvest moon / full moon and the forces of nature were in force! Of course with 8 fur babies in our house, a full moon usually means a lot of activity of crazy kitties and late night potty breaks. But this harvest moon was an exception! We had a very special visitor! We were just lounging on the couch late afternoon after our normal outside playtime, when all of the sudden we heard a cicada in the house. Or that’s what it sounded like because we sees lots of cicadas outside. So of course we went off to investigate to make sure Zaida Monkey didn’t get to it and eat it, but we just couldn’t find anything so just maybe it was coming from outside since the door was open. Sooo, we went back to the couch and I laid on Mommers lap while we put on a movie. “KaKaKaKaKaKaaaa!!!KaKaKaKaKaKaaaa!! 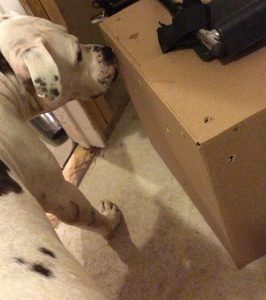 !” Oh my doggie what is that?!? It sounds like a birdie in our house! Mommers lets go quick! “Milk, Arabella – stay” said Mommers “I have to make sure Zaida doesn’t get it”. Okay Okay but show us what you find Mommers! Mommers went into the bathroom, and this lady bird with a mohawk was just hiding behind the toilet and making a bunch of noise. Well, of course she couldn’t stay there, so with just a bit of encouragement, she flew out! But RUH ROH!!!! I sees a bird flying up high in the living room ceiling. 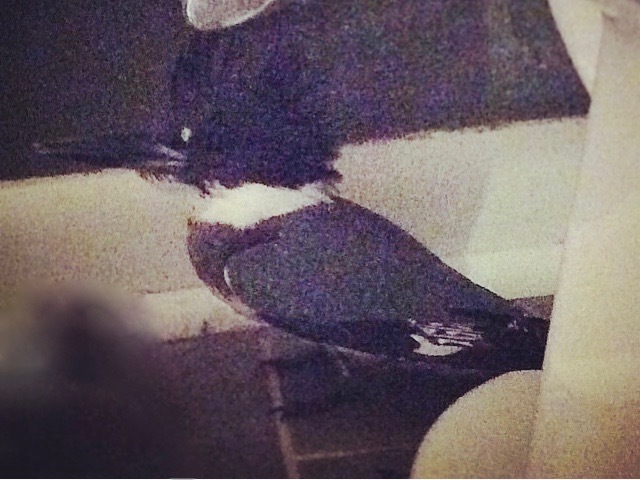 It’s flapping weird and so scared. Now it’s in the kitchen, and oops – back to the living room wall. Ker plunk! Nose dive into the wall. Something is just not right with this birdie! Mommers is trying to find a box at this point cause we are worried about Ms Azul. Finally it lands awkwardly on the table, but it’s flying was so wobbly that it got it’s wing stuck in the grove between poles. Mommers already had some towels in her hands, and member she’s tryi ng to save a birdie while in a wheelchair and moving slow, so this was not easy. But since the lady songbird was stuck, Mommers was able to carefully take the towels and wrap around this mowhawked beauty. The scared kingfisher bird instantly relaxed! She knew that we were just trying to help her! She quit snapping her long scary beak and just let the Mommers hold her and wipe her down along her beak and mohawk. You see, she had become covered in spider webs and cat fur, and other mess while flying around in our house. Ms Azul is now safely in a large cardboard box. But we just can’ts keep her there. What are we gonna do?! It’s late now on Friday so we can’t get a ride to the emergency vet and of course the phone broke this week…Thank doggie fur the online animal groups for Mommers to pawticipate. There’s just gotta be somepawdy there that can help! With Mommers call fur help (bol, get it??) she spoke with the head of Valiant Animal Rescue AND found a volunteer hooman lady from Center for Birds of Prey in Awendaw, SC. Whew! Nobody could get Ms Azul that nite, BUT the volunteer from Birds of Prey said she would be there first thing in the mawnin. Thanksaroo to these two ladies, we knew how to keep Ms Azul safe fur the nite, sleeping in her cardboard box safe away from any lurking predator kitties (uuhh, uuumm, Zaida…I’m looking at you!) 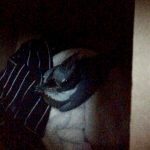 We were a bit worried, but Saturday am we looked in the box, and there was the sleeping songbird beauty, still safe and sound! Wooferoo! BUT, it gets even better! The Birds of Prey volunteer comes to our house and says Ms Azul the Kingfisher doesn’t look as bad as we thought,but she was going to take her to the center to be assessed and she would pawbably get some medicines. After they assessed Ms, Azul, the center said it was just really bad bruising and no broken wings. Thank Dog! But here’s the best part!! They were having a special group presentation at Birds of Prey that day, so they decided to release Ms Azul in front of a large crowd. How pawmazing is that! Her songbird debut release was a display of magnificence for lots of hoomans to see. Of course Ms Azul had to show off, flying around and then ultimately diving straight fur the water like a true kingfisher – lunch time!!! I am so glad Ms Azul flew into my house to find help. She was so beautiful and helping to rescue a bird was an exciting experience. We learned so much – about birds and our local wildlife rescues! Some say birds in a house are bad luck, but we agree with the humans who say a bird in the house is good luck and are so glad she flew into ours! 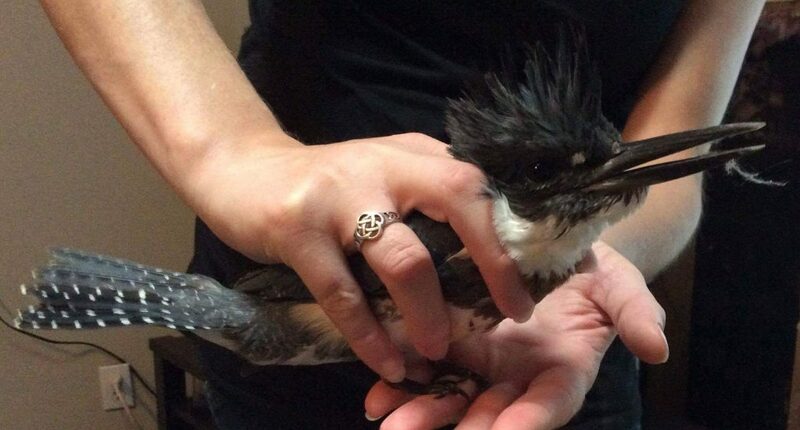 Pawlease learn how to help an injured bird before it happens! If you are in the Lowcountry, you can contact The Center for the Birds of Prey, but they have great resources on their website fur everypawdy worldwide! 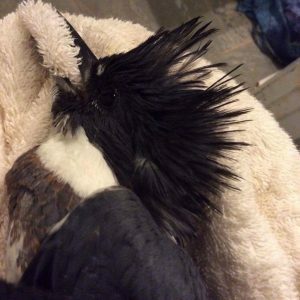 I am so glad this wildlife bird center exists here and were able to help! Pawlease go visit their page and visit their facility if you have the chance! My Saturday Staffie Spotlight goes to Lucy 2! 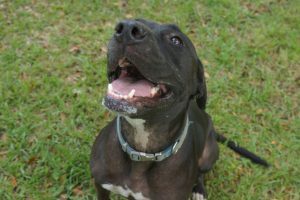 Lucy is a staffordshire terrier mix, one of the many breeds included in the pitbull category of pups. After living in the same home fur her entire life, she was surrendered by her “owner” to Hallie Hill Animal Sanctuary in Hollywood, SC. 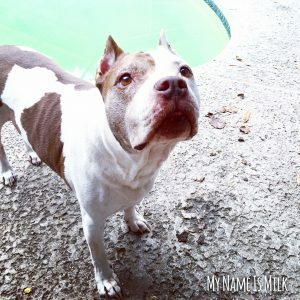 This lovabull senior pitbull dog has been at the dog rescue fur 18 months and desperately needs a new home to live out the rest of her beautibull days! Unfortunately, when hoomans give an animal up, they don’t always tell the whole story, so there are just some things we don’t know. Her hoomans said she got into a scuffle with another dog, but she had lived with that pup fur almost 10 years with no problems! Something just isn’t rite about that situation, but we will never know fur sure. What we do know fur sure is that this staffie pitbull pup wants nothing more than to cuddle up and be your bestest cuddle bug. Lucy couldn’t be in a better place as far as dog rescues go – Hallie Hill is truly an animal sanctuary where dogs have their own space with long runs. But I firmly believe that ALL pups should have a furever home. A place to call their own. 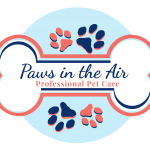 A place where hoomans wuv them and pamper them – yup! You heards me!!! And Lucy 2 is no exception! 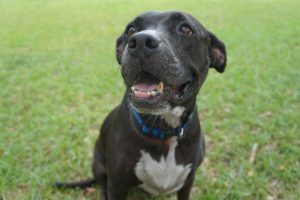 This lovabull senior pitbull is over 10 years old and needs you to give her a home! Lucy 2 is spayed and up to date on all of her yuckies (vaccinations) and is heartworm negative (HW-). As you can sees, she just wuvs to laugh and begs fur belly rubs! She also wuvs to go on walks and get treats. 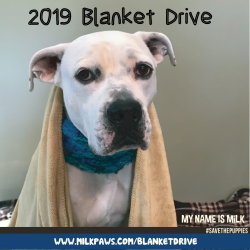 She would pawbably do best in a single pet home cause she deserves all the attention and needs to be in the spotlight for her senior dog days, but meet and greets are welcome! Want to search my other Rescue Dog Spotlights to find your pawfect pup? 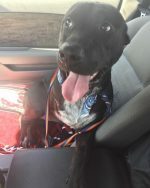 Click here to see the latest AdoptABull of the Week! Happy National Dog Day, Pupsters! Did you know NDD is a nationally recognized and trademarked event?!? And I’m celebrating in lots of ways! First we all gets a pawsome breakfast of kibble topped with wet food! Next, I’m going with Mommers to therapy, and then we’ll all spend the day swimming and playing ball. Oh, and did I mention lots of wuin’, smoochies, and the bestest belly rubs in the pawniverse?!? 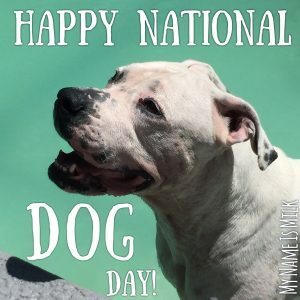 National Dog Day celebrates all breeds, pure and mixed and serves to help galvanize the public to recognize the number of dogs that need to be rescued each year, either from public shelters, rescues and pure breed rescues. National Dog Day honors family dogs and dogs that work selflessly to save lives, keep us safe and bring comfort. Dogs put their lives on the line every day – for their law enforcement partner, for their blind companion, for the disabled, for our freedom and safety by detecting bombs and drugs and pulling victims of tragedy from wreckage. You knows what I like best about National Dog Day, Pupsters? Is that it celebrates ALL dogs, AND it even has a focus on working dogs and service dogs like me! It’s gots service dogs in their statement above a few times! And, I gots to be honest, when I was sniffing around to paw my post fur this pawtastic day, I knew there was a NDD website, but I had no idea of the many resources it has. They even have a NDD Hero Dog Award! You should definitely go sniff it out. I give high paws to anypawdy supporting animal & dog rescue! Okay Pupsters! It’s time fur me to get this celebration started! I’ve got my doggie bag packed fur my service dog duties today, complete with my GoPetBento Bowl & chew toys. My tennis balls are waiting fur fetch, I’ve got my hooman furiend schedule to get me running, and the pool is just waiting fur a big SPLASH! So, tell me about your plans fur National Dog Day and this weekend, Pupsters! I wanna hears all about it! Woof Woof Wooferoo! 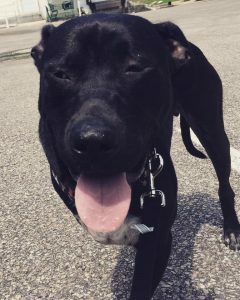 Meet Pierre the Pibble Tripawd! He’s my Saturday Spotlight looking fur his furever home! This handsome 3 year old fella was found as a stray wandering the roads of Orangeburg, SC. He’s had a ruff start to life, being found with a hurt leg and suffering from parvo. Thanks to some pawsome hoomans, Pierre had his leg amputated to take away his pain and he has fully recovered from the nasty P word. And we all know it’s a tuff thing to fight off so this boy is some special tuff stuff that will be around for awhile! 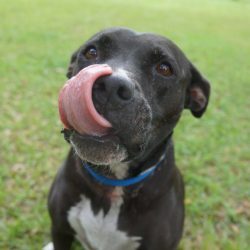 Lucky for Pierre, Eunoia Rescue of Charleston, SC stepped in and pulled him from the animal shelter to give him a chance at life after surviving all of this mess! I means, after overcoming parvo and having a leg chopped off (we don’t know how or why), they just had to make sure Pierre wasn’t let down by hoomans again! 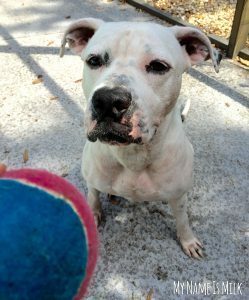 BUT, here’s the problem – because Eunoia is a foster based rescue and there are no foster homes available fur him rite now with their dog rescue, Pierre is having to stay in boarding. Although he’s not in a shelter environment anymore, thank dog!, it’s just not a great place for a doggie to live. It’s not a home. Not to mention it takes a bunch of bones (money) that Eunoia Rescue could be using to help save other dogs’ lives! 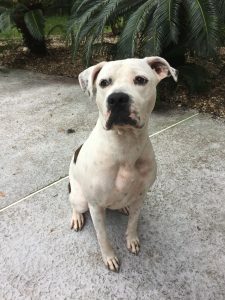 Now that you know you already want to bring Pierre the Pibble Tripawd into your home, lets me tell you a little bit more! In a home setting, Pierre is the MOST lovabull pup in the world! 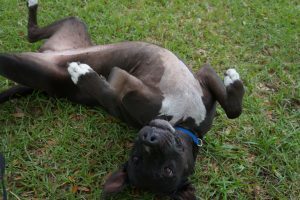 He wants to cuddle and lay beside you and he evens knows if you are happy or sad and need some extra pittie wuvin’! And guess what?? He likes ice cubes just like me – I mean, he wouldn’t really even be a dog if he didn’t would he? bol! And look at his face! He seems like he can be a bit goofy like me too! Did I mention he wuvs to lay in the sun?!? So this is where Pierre needs a service hooman! He doesn’t need you to carry him around or anything like that, he just needs a best furiend. He needs a hooman that will give him guidance and unconditional wuv and continue his training. He’s not a dog that you’ll be able to take to the dog park or puppy parties, but that doesn’t mean the two of you can’t go on lots of adventures – it just means he likes hoomans more and will be your loyal companion! Because he’s such a people pleaser, Pierre does need to be in a home with no other pets, and would do best with older kiddos (13+). He’s even getting weekly dog training with K9 Good Manners and is excelling with progress! Pierre desperately needs to get out of boarding. It’s just no life fur a dog. 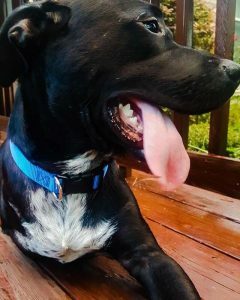 Although he would prefer a furever home, a long-term foster home would be a pawmazing place fur him to continue to thrive and progress with his training. Pierre needs to be able to depend on you and for you to give him a chance to show you he’s the best pup in the world! 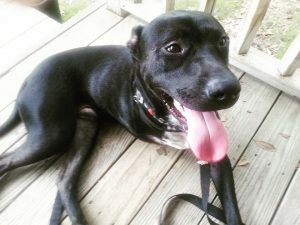 If you are interested in fostering or adopting Pierre, pawlease contact Alicia with Eunoia Rescue in Charleston, SC at EunoiaRescue@gmail.com or by calling 843-367-9797. Living next to the pluff mud here in the Holy City of Charleston, SC near Folly Beach it has been supa dupa hot! We had record highs for the month of July that we hasn’t seen since the 19th century! Century? Wait! What does that mean?? I don’t thinks I was around back then bol!! Anydog, whatever it means, it means it was HOTDOG city! And what does that mean fur us pups? POOL TIME! Wooferoo! 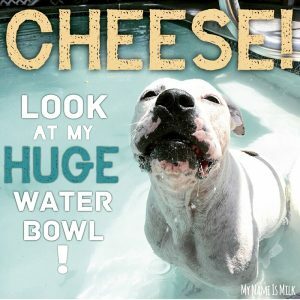 I like to swim in my own special way, BUT drinking the swimming pool water is the bestest EVER! I has all the water I want, whenever I want it! And it never, ever disappears! Can you see the water droplets dripping from my chin? I was so happy and proud to show Mommers by BIG discovery! Since it’s so hot, I stay on the tops steps when I’m outside. Gotta keep my white coat hydrated and beautibull ya know?!? Arabella, AKA BatEars is all smiles fur the camera! She just finished swimming laps and diving off the side fur her nylabone rubber stick and tennis ball. She is practicing to be a dock diving dog so she can compete with our local Palmetto Dock Diving Dogs chapter! How pawsome is that?!? 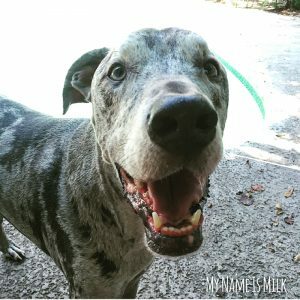 Cloudy is just a big goof merle Great Dane with a smile as big as he is. He won’t get in the swimming pool either, but he wuvs to run and chase around the outside of it. He’s just gotta get dizzy! When Arabella and I are fetching balls and sticks from the water, he is always rite there in your face (yes, a lil too close sometimes bol) barking cause he wants to play and get in on the action, too!